The first ever Asian and Filipino, Internationally-acclaimed and multi-award director Brillante Mendoza in cooperation with SM Cinemas presents his independent movie films and productiosn in SM City Cebu specifically at Cinema 2 come this coming August 4 and will end in August 5, 2011. Take note that this Film showing is for Free and no charge is asked. Synopsis: It’s presidential election time once again and like the rest of their fellow Filipinos, the native Aetas are required to vote. But how can a community take part in the elections if most of the elders do not know how to read and write? A young Aeta girl has the answer. Winner, Best Picture and Best Director awards, Cinemanila Film Festival 2006. Synopsis: Two elderly women bear the consequences of a crime involving their respective grandsons. One grandson is the victim, the other is the suspect. Both weak and poor, the two grandmothers laboriously solicit money in the midst of a storm, one for her dead grandson’s burial, the other for jailed grandson’s bail bond. AWARD: Winner, Grand Knight award, 27th Miami International Film Festival. Synopsis: Set in Pampanga a decade after the province was ravaged by the lahar from Pinatubo, Kaleldo follows the lives of Rudy Manansala, a woodcarver, his three daughters and their relationships with other people in the span of seven summers. Winner, Best Actress award, Durban Film Festival 2007. Synopsis: A drama centered on the state of foster care in the Philippines, the movie tells the story of a poor family of squatters who takes in a foster child under their wing. 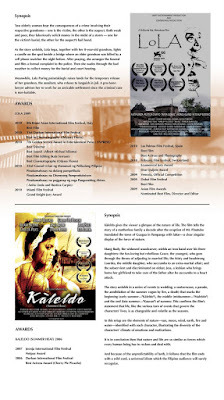 Winner, Best Picture and Actress awards in Durban Film Festival 2008. For inquiries, please call SM Administration Office at 231-3446 to 47.